∗ Machine controlled with PLC. ∗ Fully automatic machine. Setting is completely digitized and mostly automatic. ∗ Machines for both side stripping. 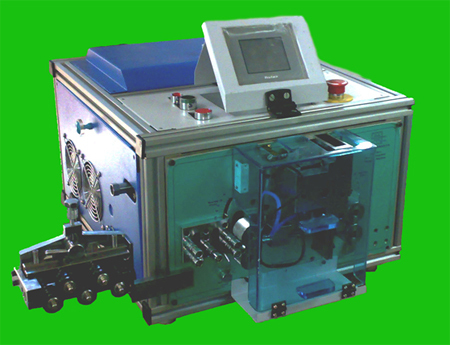 Multiple Wire Processing Can process 2 wires at a time for Wires upto 6.0 Sq.mm. For rigid wires, the machine may get de-rated. Change over setting time 30 sec typically. Machine Housing Machine housed in “Industrial” frame with Aluminium Profiles. * Speeds mentioned in bracket are with two wires at a time. Voltage Servo-stabilizer (2 KVA) or CVT (1 KVA) is must, to be arranged by you. Proper earthing is essential.